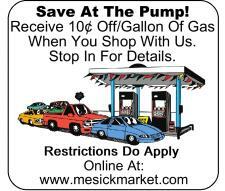 A single purchase of $50 or more from Mesick Market qualifies you to receive a 10¢ per gallon gas discount on your next fill up at our Buckley General Store. The purchase of tobacco or alcohol does not contribute to the $50.00 minimum purchase. Present your coupon before pumping your gas. Maximum 20 gallons per coupon.